Realme 3 Pro will be launching in India on April 22 at a launch event in Delhi University. The company has been teasing for the upcoming launch confirming the key features of Realme 3 Pro. 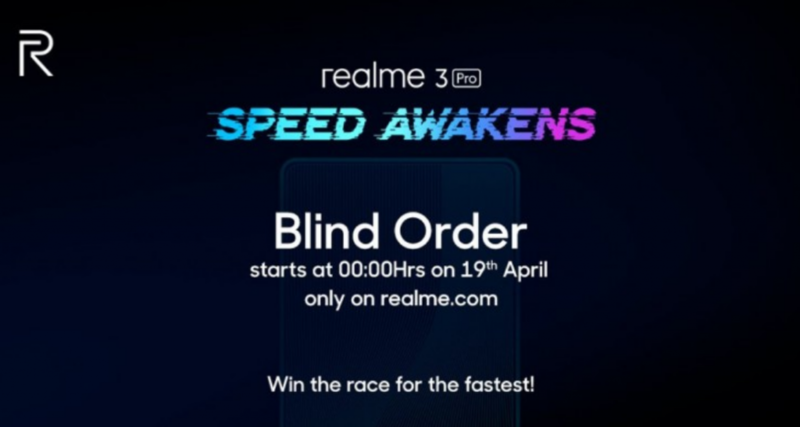 Moreover, Realme has announced on Twitter that the company will be carrying out blind pre-orders for the smartphone form April 19 at 12 AM. What do you mean by Blind pre-order? Blind pre-order probably means placing an order of the phone without knowing much about it. This means the company wants people to pre-order the smartphone without knowing its official specs. The Realme 3 Pro pre-orders will begin at 12 AM on April 19 via the company’s official website. Realme India CEO Madhav Sheth tweeted about how fans can take part in the blind sale of the Realme 3 Pro. Interested people have to first register themselves for the pre-order on April 19 without having to pay for it. After registering and pressing the Order Now button, the customer will receive R-pass of the Realme 3 Pro. Mr. Sheth has also confirmed that Realme will offer a total of 5,000 R-passes to its fans. The lucky winners can purchase the device upon its launch and avoid the hassle of flash sales. So will you be interested in the Realme 3 Pro Blind pre-orders? what do you think of it? We are sure Realme fans out there will be definitely registering themselves for the pre-order. What about you?